I’m having problems with tying a nice herl head on my flies. Does anyone have any tips to improve my technique. Such as which part of the peacock feather do you use? Which side? And which end? I am continually breaking the herl when I wrap it. I’m using Robert Smith’s book as a guide. Barry- it could be you have fragile herl...try a thicker piece from lower on the sword. Also remember: “your previous step dictates the fit and finish of the succeeding step”. There is a big difference in peacock swords, with regard to how fragile each one is....I have both ends of the spectrum as well! 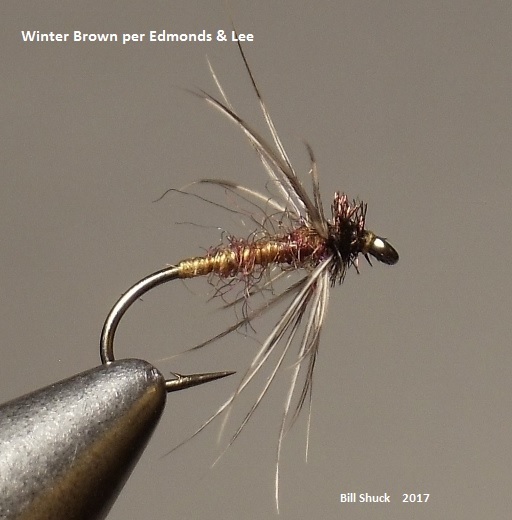 Earlier this week I was watching a tying video on YouTube, where Davie McPhail was demonstrating the herl head on a traditional North Country spider pattern. - He tyed the body of the fly, then wrapped the hackle collar, leaving a gap at the head of the fly for the herl head. - The area behind the eye (roughly one eye diameter in length) was wrapped with thread, forming a level base. - The peacock herl was selected (choose a nice bushy one if possible). - The fine tip was trimmed off (clip off roughly two inches from the tip end). - The single strand of herl was tyed in by the tip end, just behind the eye of the hook. - Davy had a neat trick when tying in the prepared strand of herl. He would tye it in with a single thread wrap, right at the eye of the hook. He then gently pulled on the herl fiber, to even up the end. - Thread wraps were made from the eye of the hook, back towards the hackle, then forward again. This secured the herl strand in place. - The herl was wrapped forward in close touching turns, over the superglue (makes fly durable for fishing). - After the herl head is formed, the end is captured under the tying thread and a small head is whip finished. The tag end of the herl is pulled, breaking it off cleanly under the tying thread. Let me see if I can find a video link for you later. If Davey McPhail does it that way it it has to be good! I personally do two things different. Number one: each individual herl that I pull off the sword I hold between two fingers in my right hand and then pull the tip with two fingers on my left hand, breaking it off successfully until I get to the strongest part .....sometimes you have to go through two or three herls to get a good one. Number two: I twist herl around the piece of brown thread sort of making a dubbing brush and then wrap it that way ....it makes it much stronger. I finish the head with a whip and clean break - hope this helps.. Fantastic thread, fellas. I need to fool with this again. It’s been awhile. Great tips. Historically I have done it like Davy but without the Super Glue. I think I'll add that step in the future. Yet another beauty, well done by Bill! Beautiful Bill. That looks like nice bronze heel too. Love that stuff! I have some from our buddy Jeff, but use it sparingly. Thanks for all the tips, now off to the vice to give it a try.